Thursday, the 14th, was one of those days. 20 experienced sitters entered the especially equipped séance-room on the first floor of the Basler Psi-Verein in Switzerland. 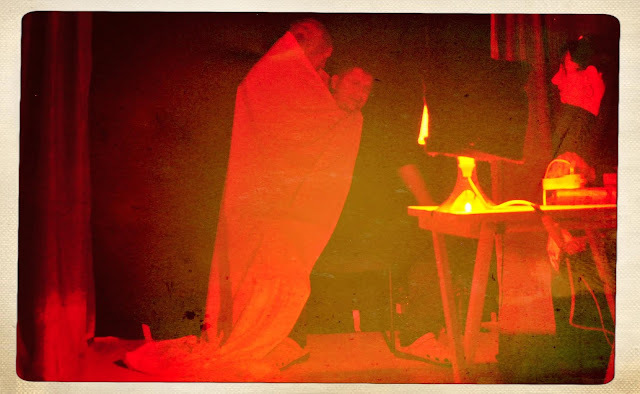 For more than 8 years we experiment and hold spirit-ceremonies of the Western Hemisphere, séances, in the spaces of this renowned location. 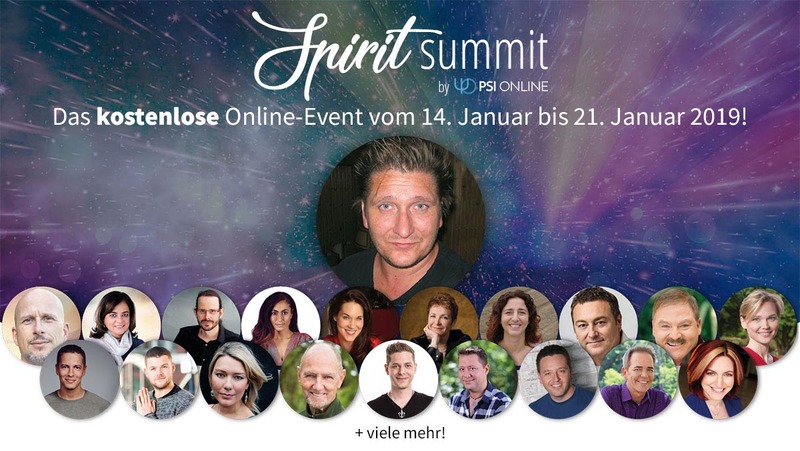 For decades the Psi-Verein is worldwidely recognized for its engagement in the field of experimental Parapsychology and international events like the Basler PSI days and a monthly programm filling up a three-monthly printed publication thick as a book. Last year it was celebrating its 50 year birthday, what says all. The lights became dimmed, the door hermetically closed, two windows double-shielded, the red light flickered and tinched the room into warm red light. The intensive introductory talk about the history of Materialization Phenomena within Spiritualism and beyond was still echoeing in everbodies awareness. A short affirmation finalized with a loud 'So be it!' in unisono signalled the spirits everything was ready to become! From here on I switch over to the narratives of present sitters and the recording of the séance. My own memory went to sleep a few minutes later. A spirit personality, totally seperated from mine is then taking over for approx. two and a half hours. It is the main communicator 'Hans' and he is functioning on its own behalf. 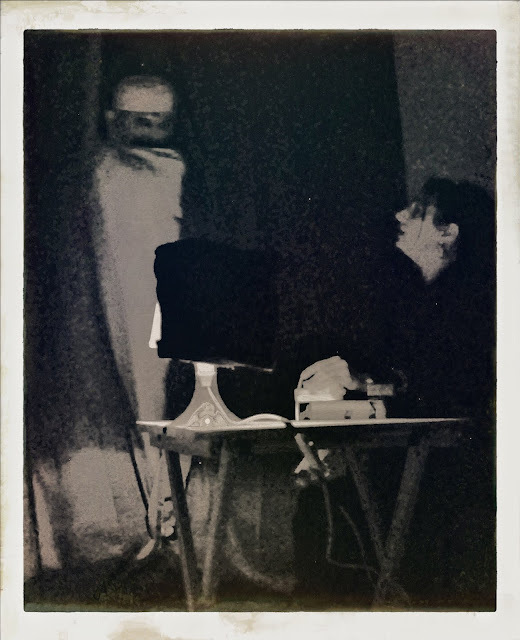 People were accompanying the powerful chants of the 'Crystal Shaman' (Lex v. Someren) and slowly the lights became dimmed down fully. Strange flickering lights appeared soon in front of the cabinet! It is only seperating the room with cloth on its front and on one side, the other two sides of the cabinet are made of concrete wall. The medium is heard breathing all the time. Then 'Hans' comes through and talks about the tonight efforts to bring in a personality we know of since the very first sittings of the Felix Circle, the Gatekeeper 'Ptah'. A strange transparent handball-sized whitish mass illuminated by flickering lights inside very shortly showed up two or three times on head height in front of the cabinet opening during the very first words of 'Hans', the main communicator. After the greetings he talks about the setting of the evening and asks the sitters if they are willing to support the planned visit of 'Gunpo Yeshi', called 'Po', the blind tibetian monk, who is the human form of the Gatekeeper Ptah, energetically! The crowd of sitters cheers and applauds. 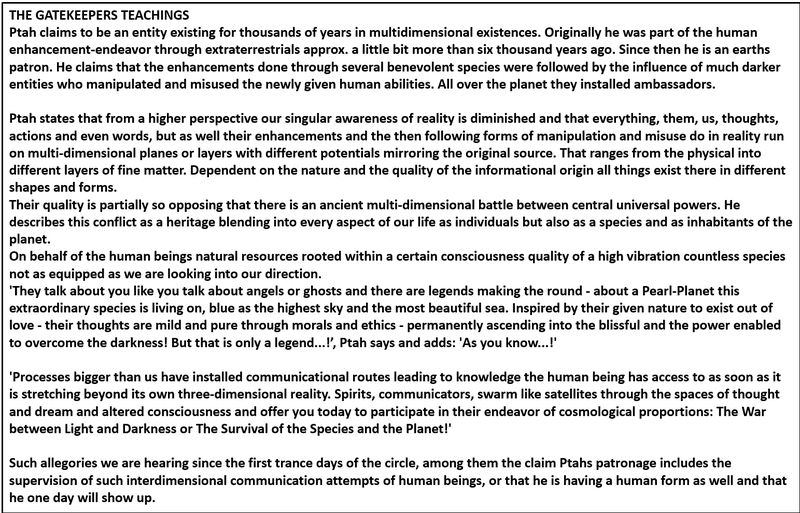 'Hans' then describes shortly the history of 'Ptah in the Felix Circle', meanwhile the sitters see through tiny openings massive blue lightning going on inside of the cabinet. The blueish light is well known for the 'spirit-portals' building or opening...! After another chant Julia opens in the dark both curtain sides, gets back to her place and hears the knocking signalling 'lights on'. Here the photographing set in and began depicting the phantoms building process in mainly 7 pictures. Smoothly the entity rose and grew up from short height, on chest level of the medium, up to above mediums head looking down to it. Something intensive was then going on. Not that the process wasn't incredible enough anyway, a following moment for the spectators was like frozen in time when in a great stillness the phantom seemed to look down and inspect - full of interest and affection - its medium with a palpable intensity. The camera was luckily able to capture this moment in time (many thanks to photographer Lucius Werthmueller) in all its glory (see the image below). Some had the impression there was a kind of telepathical communication in these intense seconds because even the entranced medium had a blissful expression on its face. But asked the medium responded having no memory at all. The white material depicted here, like in previous experiments, is a historical artefact in regards to spirit materialization and is used like a robe for the entities. 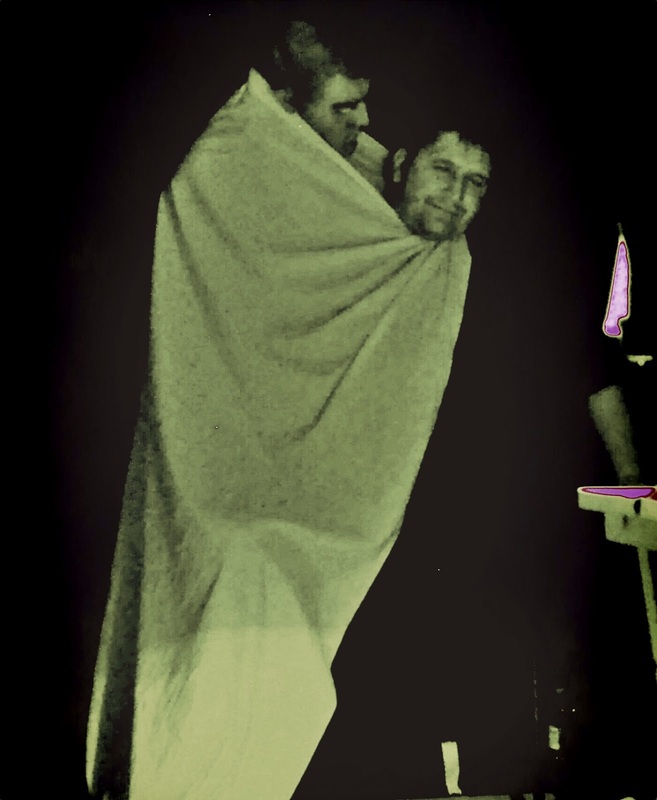 Originally called 'spirit cloth' in the Western Hemispheres ceremonies, it was believed to be the burials shroud at first but was later understood to be an ectoplasmic fabric of some sort. 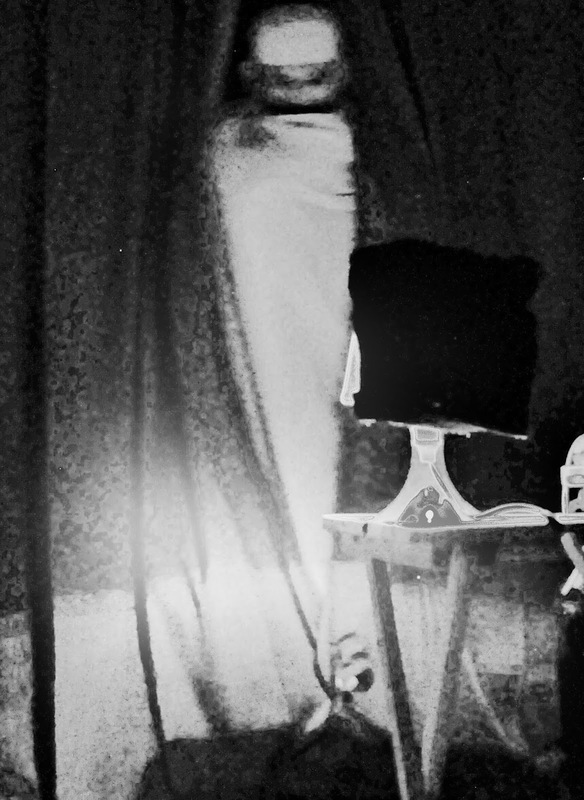 Ectoplasm appeared as fabric countless of times in the history of Spiritualism and made its understanding not necessarily easier. But it is what it is. The 40 WATTS of red light were fully turned up positioned 2,5 - 3 feet away from the phantom fully illuminated by it. Two enduring exposures to the observation of the sitters were realised at this stage of its presence and everybody watched the development and behaviour of the phantom in awe. 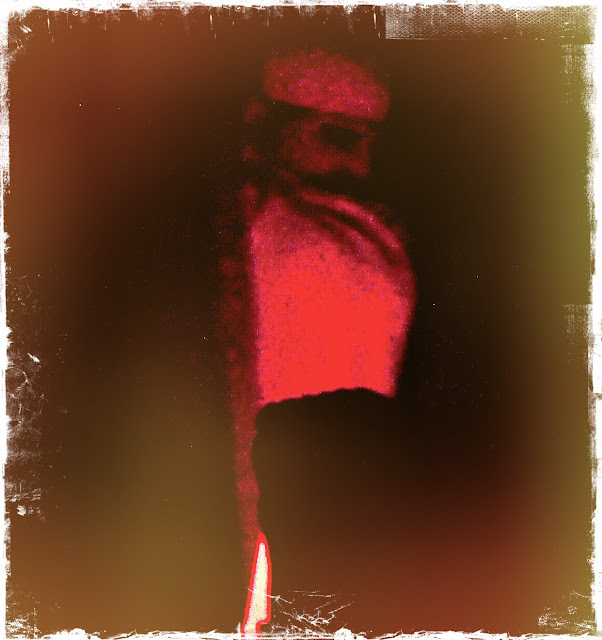 When the light was switched off then the phantom began to speak with considerable difficulty. After two sentences the main control re-routed the Monks voice over to the mediums speech-apparatus. And meanwhile the monk spoke through the medium another exposure stage was starting to happen. 'Over the last decades our voices have turned into sirens! ', Hans said often in the past. 'We have to join forces on the battlefield - to overcome the threats plagueing our realms. Side by side we will stand in the battle of light against darkness! ', Po said through Hans. 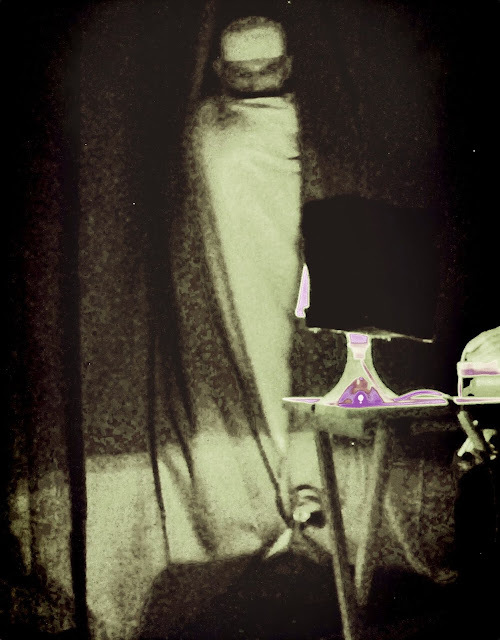 Over the last years in this mediumship the message of the spirit entities included a recruitement of light-workers via the famous 'Activation Stones'. Magical artefacts reminding and activating our true nature and potentials becoming conscious hubs in a defense-network interconnecting us back into the great Oneness. 'So I have returned to tell you your time's still coming! ', the monk said in his first appearance. And that he will return ...! 'Po' spoke to the sitters in broken english and when standing in the cabinet entrance he showed extreme oriental facial features. For some it seems as if these features have intensified somehow since the first photos were taken. The present sitters though underline it was definitely one and the same entity, but with headdress...! Others suggest the extraterrestrial nature is blending over and start showing up in this last exposure sequence. We cannot really clear that up. The entities presence transported powerful palpable moments and delivered a message of hope and universal love! Then 'Po' disappeared behind the curtains and only shortly later 'Hans' asked for their re-opening to show sequences of 'the dematerialization-process'. This time the sitters did neither see entity nor medium, but a massive man-height sized bulge of white material and a silent blue lightning storm inside of it, probably transporting the entity back to the spirit realms. Specifically consider the matches unrivaled behaviour-patterns in these supposed fields... Enjoy! 'After having deeply within overcome the illusion of the three-dimensional world - and the illusion of the self, the dream we live within another dream, there's nothing really left, between me and my focus-objects, but thought, mind, spirit, consciousness. Here we go with 7 episodes of it! Don't miss one, they all show different aspects of extraordinary events from different perspectives! Specifically refering to the erected matches in the PK-field and their levitation at the end of episode 7! This cannot be duplicated by stage magicianships tricks, like hidden threads for example, because the match has not enough physicality to ballance it on such a thread, we suppose! In the typical mockery and unproven allegation specialized internet forums, fed and nurtured by commenters never having witnessed what they are writing about - waves rise high about speculations, if the under séanceroom-conditions mediumistically produced objects have existed beforehand or could be anyhow found in our reality-matrix. In times of amazon and ebay we do allege one finds more or less everything purchaseable! No matter what any out-of-this-world process may paranormally produce. one of the questions to be asked should be: how would an object look like, that has not existed beforehand on earth, about which there is no concept or blueprint available or existent yet. And how would a spirit team try to prove their materialized objects have a true paranormal background? What kind of object would suffice to fulfill the standards of the armchair sceptics - an object existing but not having existed anyhow beforehand!? 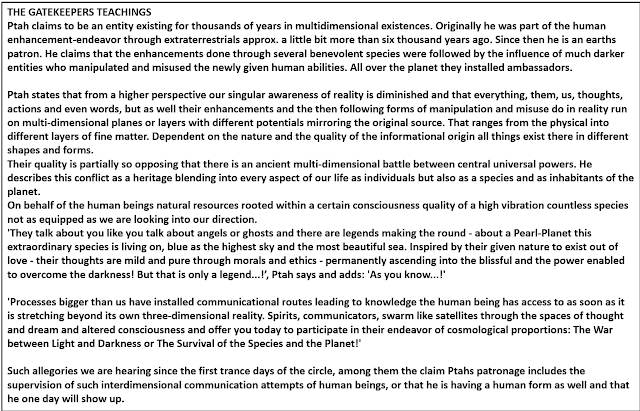 What is needed to consider, something is going on out of the ordinary - letting already besides the hundreds of descriptions, outlining strangest observations and conditions under which the medumistically produced objects have seemingly appeared. INTERESTING ECTOPLASM GEMSTONE. A Stone from the Universe - created from the 4rth Dimension! 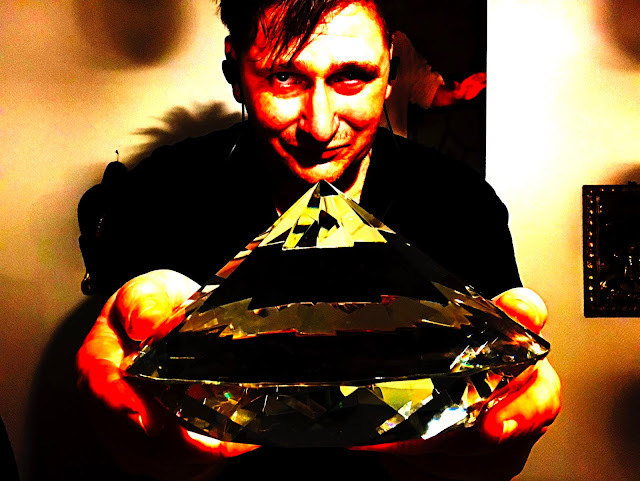 The renowned stone expert from Switzerland Bruno Vogler Pfeiffer describes in the article his surprise and inability despite his 30 years of experience in this field to define the stone that was materialized for him. Several of our sitters have approached us with additional reactions from Jewelers and Stone Experts from all around the world! 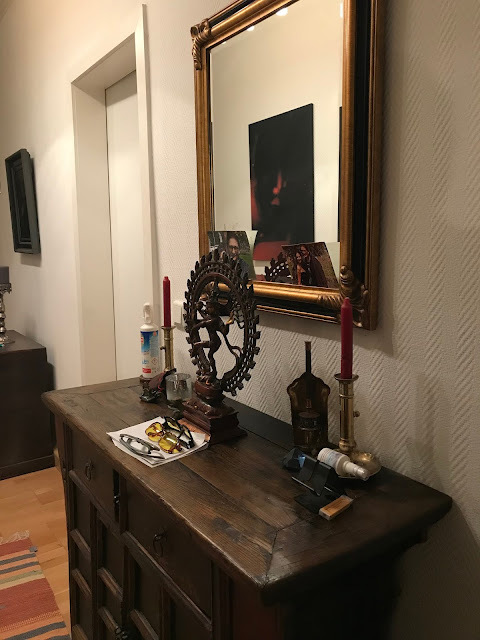 The Felix Circle in its apport history has many instances that strongly speak against the theory, the presented objects have been purchased beforehand. Lets take a instance out of the Prof. Stephen Braude investigation. Happening in the Austrian Séanceroom Laboratory, where I was observed for a week and where we experimented under strictest scientific scrutiny to the full satisfaction of the scientists. An afternoon session for apportation was set up and several objects appeared paranormally under full control of the scientists, like for example an index finger sized salt-like crystal exiting suddenly the mouth of the medium after extensive visual and palpable checks of the mediums empty mouth. produced A NUGGET OF 100 % COPPER! Do you need more proof underlining the genuity of the processes? I have endless stories. THE MERCURY APPORT. 10 minutes previously to a Felix Circle sitting our unquestionable then circle leader Prof. J.S. mentioned in a coincidental remark the Scole Group apport of a 50 years old News-Paper page with a thematically interconnected story about H.Duncan on it. 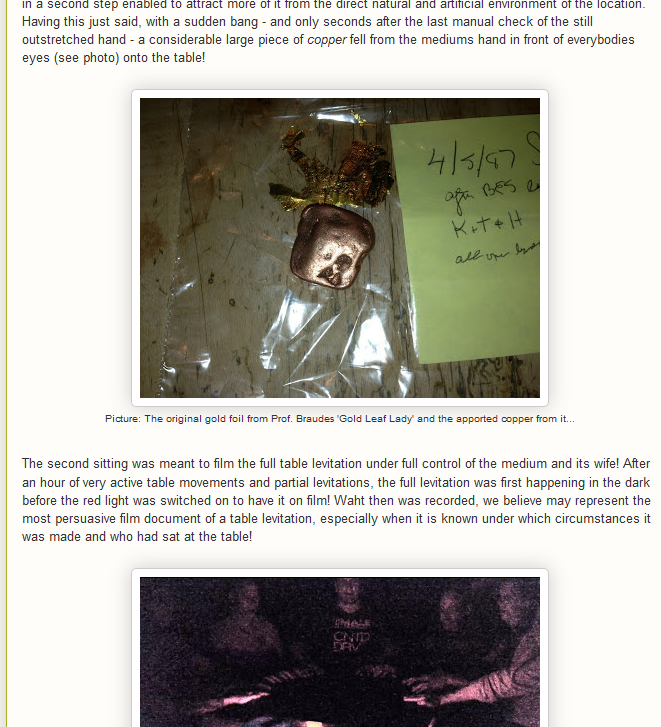 We reacted amazed and expressed our wish to also achieve such a powerful apport: TEN MINUTES LATER A 50 YEARS OLD NEWSPAPER CLIP MATERIALIZED ON THE SEANCE ROOM TABLE WITH THE STORY ABOUT OUR MAIN GUIDES HANS BENDERS EARLY INVESTIGATION IN A HAUNTED CASTLE. PROVEN HANDWRITINGS OF THE DECEASED? We have the expertises! GOLD AND SILVER PIECES EMBEDDED IN TWO GENUINE SHELLS? TRUE GEMSTONES AT DIFFERENT OCCASIONS? HUNDREDS AND THOUSANDS OF GLASS ARTIFACTS AND RELIGIOUS FIGURINES AND SYMBOLS OF ALL SORTS? Back to what the sceptics do demand, obviously with every single process another beforehand in the matrix non-existent object. We have experienced that the spirits more do work with images and blueprints existing and reproducing them! We have been in Glastonbury, Sommerset, having given Séances at the Parsonage retreat, when we in the afternoon in a group of eight or so found a beautiful Buddha-Statue in a Shop and Julia said, she liked it.. Julia said, apport it, and I joked 'I put it on the list, but don't let me go somewhere alone, that nobody can claim I secretely purchased it'! 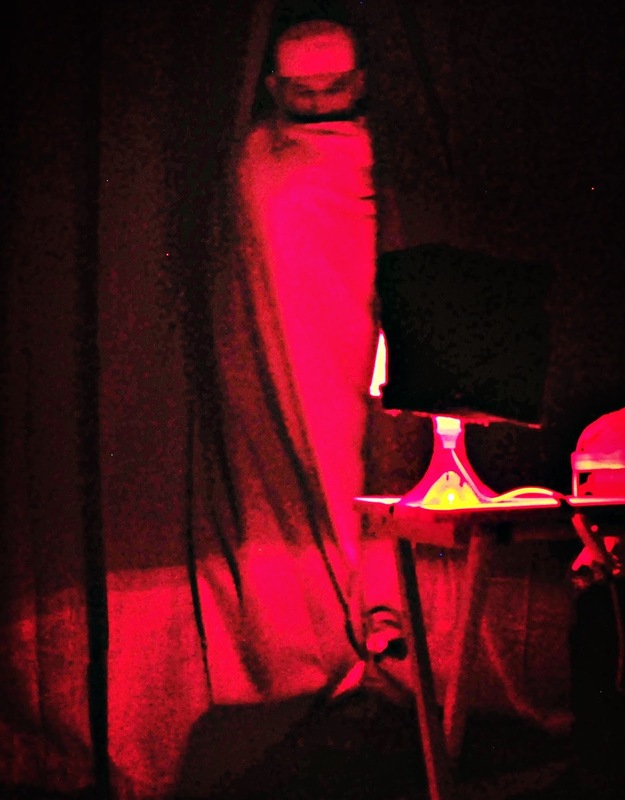 In the evening the Statue appeared in front of Julia in the Séance with a flash of light! So we in the contrary believe that the spirits use existing patterns and reproduce them paranormally. They may even use images existing in the mind of the medium - nothing would lay closer, but the outcry of the sceptics. So to be honest we don‘t present in the séances anything else but what the group related effort energetically enables and manifests during our sessions. 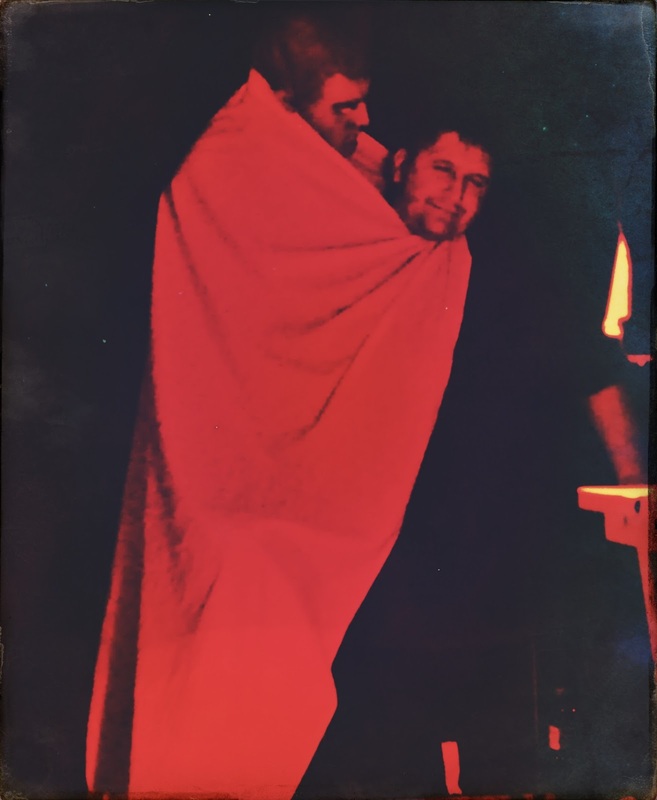 Today we would like to share with you some images which in their mysteriousness are undebateable and more or less even standard for visitors of our séances. 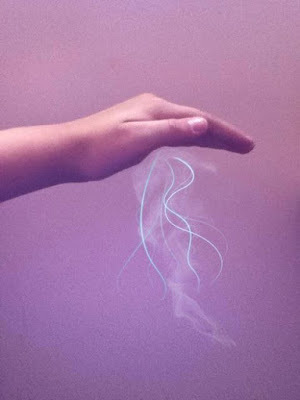 At least what the occurrence of spirit lights concerns - Materialization of negative matter in different forms - like in earlier days often cord- and/or rubber-looking like substances and the extraction from patients bodies - happened here and there but was never common. The black capsule shown in the film was feeling like rubber as well, was soft with a harder inner core actually and even melted when destroyed afterwards by fire. The destruction of the compacted negative force is due to the protocols from the spirit controls. So now simply enjoy the confrontation with the mysteriousness of spirit-phenomena, facilitated by Entities and Spirit Scientists from the Felix Circle Spirit Team in the following two videos...! This is our very special Christmas Message with the story about the biggest materialized artifact we have ever received until today. Yet unpublished we will share with you for Christmas the story of the Materialization of a 4.2 kg heavy so called ‘Activation Stone’ - and under which peculiar circumstances it appeared. 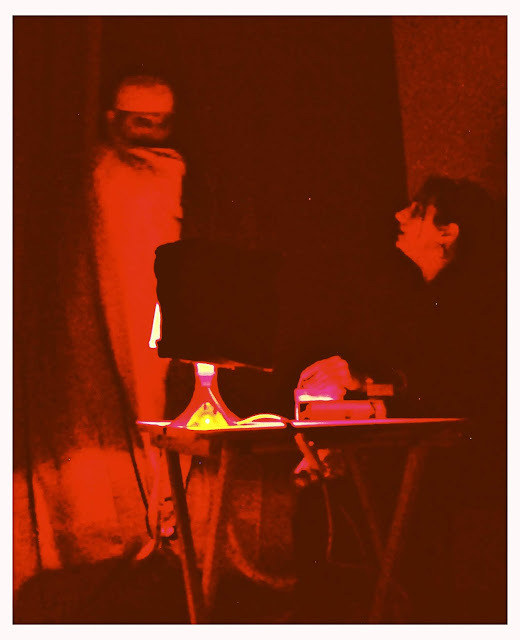 Most of the respected readers will know that Kai is the Medium of the Felix Circle, working with spirits regularly materializing objects in huge numbers during his internal and semi-public séances. There a huge variety of objects, artifacts and materials have been produced from nothing else but thin air, as well in scientifically strictly controlled sessions in which - for example - a copper foil was used as focus object for Kais spirits, told to the medium just when entering strip-searched the always locked séance room. Minutes later out of Kais outstretched bare hands - after several interventions checking them repeatedly by three scientists - a copper-nugget was heavily falling and dropping with a considerable thud onto the table. But also in private friends and family and specifically Julia had dozens of episodes when objects were falling from the ceiling or were building from the mediums body directly. Objects have appeared and disappeared in his social environment also when Kai was not even present - but very rarely only - even though it’s a fact this has indeed occurred. More renowned are the objects spirits let appear in Kais eyes under lighted conditions, when up to 9 objects have been observed coming from each one of them (semi-gemstones). Several weeks ago now it was early evening when Kai was facetiming (video-phoning) with Julia (wife) like they always do. It is for years they are commonly using Apples video-phoning service when they are not with one another. Kai sat like usual in his living room and Julia saw him there, with the canvasses of Austrian Physical Medium Rudi Schneider and Schrenck’s famous main Materialization medium Eva Carriere (‘Phenomena of Materialization’) exuding ectoplasm behind him at the wall, talking to her. Suddenly Kai seemed to be distracted, but just a bit, instantly refocusing back onto the conversation. But then Julia as well through the phone heard things somehow shatter on Kais side and saw him rising from the sofa, with her ‘in his hands’ online: ‘What’s going on out there, it’s the second time now, I just heard something before!’ he said. Having returned late the day before after an exhausting one-day-trip to Basle to see a famous speaker Kai had left on his floor-cup board a typical small paper bag, containing 3 Cds and a used bottle of water. Julia could see through the screen these items now spread onto the floor and the bag lying fell aside on the cup-board. ‘Oh, the bag fell aside!’ Kai said when he was approaching the items on the floor meanwhile at the same time he grabbed for the paper bag to lift it back up, when something strange was happening. The bag like adhered to the cupboard and with the drive of Kais move he ripped the bag right open to its half. Julia recognized by Kais utterances something was going on and when he turned the camera into the direction of the bag both started to scream. 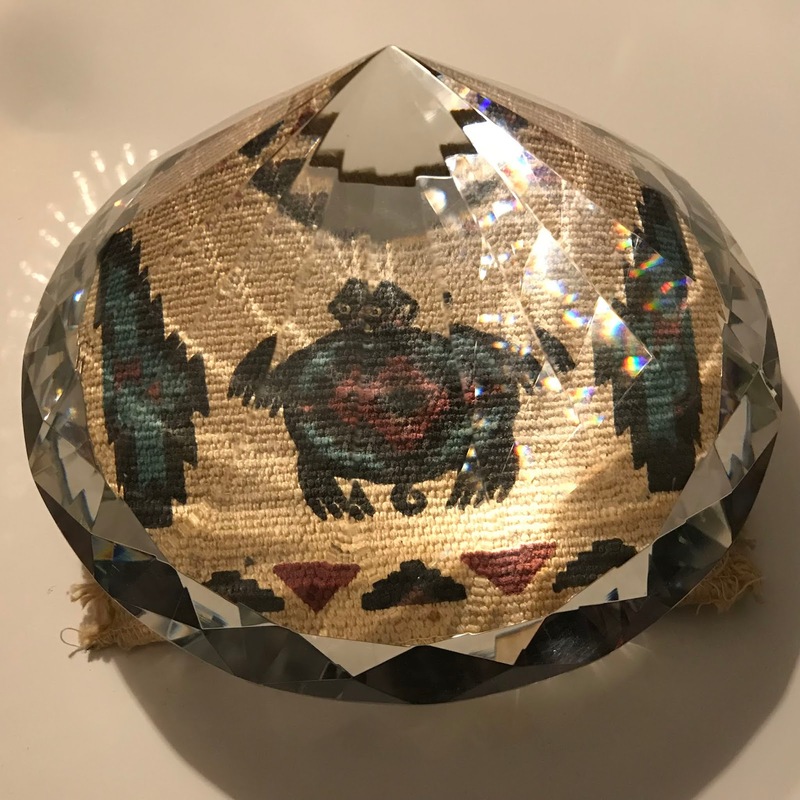 It looked as if the stone had literally grown inside of the bag shielded of anyone’s observation, like in a cabinet or the darkness of the séance-room. Starting to take its unbelievable form and size it must have pushed the bottle out first and continuously growing a few seconds later the CD’s were pushed out as well! Kai couldn’t take it out of its paper-womb with one hand and had to put down the phone to excavate a massive beauty: An ‘Activation Stone’ of unbelievable size. Later we learned the stone had a span of 21,5 cm with a weight of 4,2 kg. Today Kais has worked with the stone and a handful of sensitives, friends and clients, all testify a breathtaking effect of it onto them - some even felt truely like giddy when approaching it unprepared. Like with all 'Activation Stones' before there is a range of therapeutical implications coming with the new one as well for healers and for alternative spiritual, magnetical or Prana-healing methods and additional treatment forms. Moreover we believe it has a definite source character of some sort implemented. Having materialized uncountable 'Activation Stones' of all sizes and names before, like the 'Center Stones', the 'clear personal' ones, the 'Blood Stones', the 'Sun- and Earth-Stones', the 'healing stones' - this one has such a clear source character why we call it 'Master Stone'. The by the Spirits materialized Stones stand for the good in us human beings and what we make of our potentials. They represent our spiritual Supernature and our awareness-development and strengthen these ideals as physical projections of and proof for that! Like the spirit of christmas-time they interconnect the love and the wonder, the truth and the higher values living in us! Today Kai talks about a specially initializing episode of the dynamics occurring in the Felix Circle. What nobody was knowing at the time was the fact that 'Imperator' and his plans became the gateway to the 'spirit team', 'the Alchemists', who were like testing the group with this photo-work to validate if capable to move further with them. Ending did the episode because no more films were available to purchase for the Polaroid Camera originating from the 70ies actually. 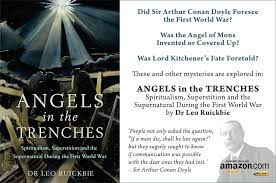 ‘Angels in the trenches’ is historian, sociologist and Paranormal Reviews Editor Leo Ruickbies newest achievement after his 2016 well acclaimed ‘The impossible Zoo’. No, Ruickbies standards and requirements lay clearly beyond the well-known and already exhaustively discussed. What he is presenting in his new work is not less than a particular dissection of the continents recent past, facilitated with the hand of a master surgeon, namely of the WWI years and its societal sensitivities - mainly but not only of the British - and how these did interrelate and interfere with the most influential spiritual movement ever having occurred in Western Society: Modern Spiritualism! Therefore Ruickbie digs deep and presents to the reader with an insight and overview only the diligent historian has contemporary historical materials from different publications and correspondences rendering the change in society’s perception from the age of enlightenment into a state of willingly accepting or even purposefully seeking for the supernatural. At the time maybe not even worth a short remark in the news-section, informations among many, in retrospective indeed the very moments that impacted the collective unconscious sustainably and enduringly, uniquely presented in this collection of relatively short episodes. The books chapters are short, sometimes changing with the next page and so sending the reader onto a specifically determined curvaceous ride into the past. It is Ruickbies psycho-analysis scrutinizing how step by step Western Spirituality started - suffering under the terror of WWI and experiencing personal loss of loved ones into the millions - to circle more or less solely around the question of and proof for Survival - and not let’s say rather ‘classically‘ exploring the path to epiphany and enlightenment. 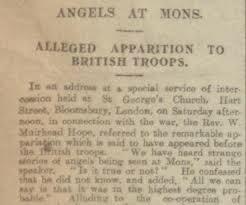 Angels in the Trenches is hence a thorough, dense and intensive, oftentimes surprising read, revealing many never before interrelated facts underlying an important younger section in the metaphysical evolution of mankind and its western perspective. They today restrict western spirituality by evaluating its efforts exclusively if addressing the quest for the proof of survival. Conditions that many do believe deserve a critical review …. The book is therefore a clear recommendation! - to learn about the Manaia Ceremony reuniting the Whale-Bones with the sea they're coming from and activating thus their protective character. The Maori are the only ones who are allowed to work with Whale Bones of dead Animals to handcraft the Manaia-figurines that cannot be purchased, but can only be overgiven by a member of the Maori-tribe. We really feel deeply honored! We moreover would like to express our thanks to Mac Kelvie West Spiritualist Churches President Ross Thompson, whose commitment enabled our stay in NZ and to Churches Project Manager Maggie Nicol, who organized everything perfectly! 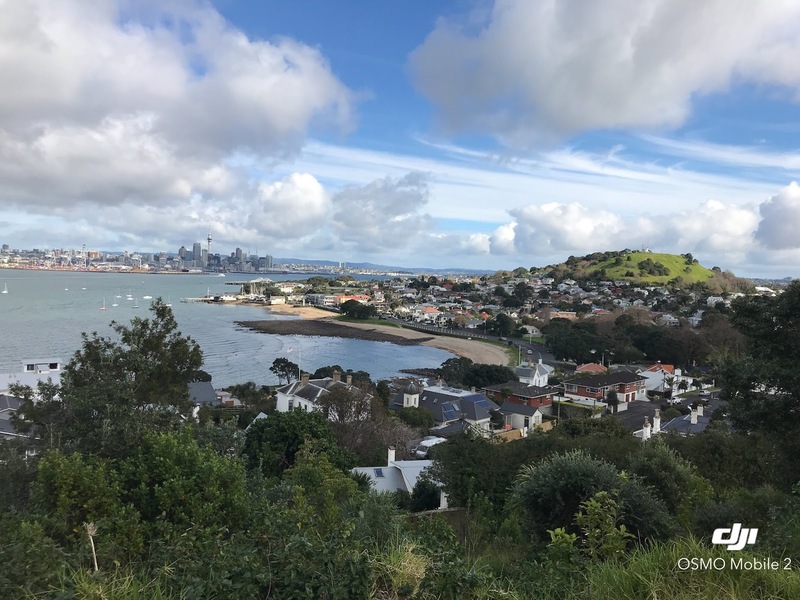 Like them Petta and Damon Wipani enabled our insight into the world of the Maori and showed us the stunning sacred places, partially shown in the video! Watch the Video when you have 20 min. off in a slightly darkened room in high-res and Full-Screen at best and use your headphones!